Roger Cox was the fastest riser in the entire list, last year slipping in on place 100. His listing this year was met with loud cheering from his peers. Addressing some of them at the festive reception afterwards it was explained how the victory in the climate case was felt as something belonging to everybody and as something making life easier. “The discussion has shifted to solutions instead of debating wether climate change is man made” was one such a reaction. For those who missed out on the news, Roger’s book Revolution Justified, already published in 2011 by our foundation outlined his strategy to make claims against states with regards to climate change. 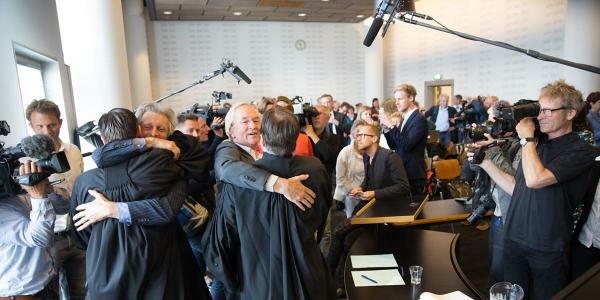 It was this book that formed the groundwork for the Urgenda case, which brought the victorious verdict ordering the Dutch state to cut their greenhouse gas emissions considerably. Roger as one of the lawyers in this case, was overcome with emotion when the verdict was presented, as were many other’s in the room. The magnitude and importance of the verdict was felt instantaneously. It is remarkable that a simple court case could have such an impact. The case hit the world headlines and climate lawsuits are now also being prepared in several other countries for instance Belgium. Cox is involved and endeavors to spark similar proceedings in other countries. Roger Cox was ranked number 1 by the Sustainable 100 jury for the criterion of ‘decisiveness’, ahead of WakaWaka co-founder Maurits Groen and plastic crusader Boyan Slat. Roger was ranked third for ‘innovation’. In September, the lawyer received the Sustainability medal, for his efforts as founder and director of the Planet Prosperity Foundation.